You've gotta check out the new FireDex Leather Pull-on Boots. They're the new, advanced Fire Boot Technology that are designed to cushion the impact to your feet and your budget. They're an all-new lightweight Leather Structural fire boot engineered for superior performance, comfort and value. 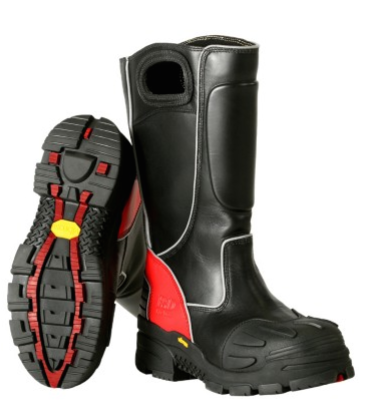 These boots are an NFPA boot that are certified for Structural Firefighting. With advanced features, made of quality materials and constructed to improve durability and protection throughout, these are a boot you'll love. The large pull-on loops are built into the cushioned collar so there's no way these can close or come off. Putting them on, even with gloves on, is always fast and simple! The ANSI-protective composite toe cap has a 3D vulcanized rubber toe and heel guards. This will protect you against heat, abrasion and any impact you may come up against on the scene. Simply put--if you compare FireDex to similar boots you've got better protection, more speed, more comfort, for less money. You can study the diagrams and photos on our site, you can see the no-compromise construction, attention to detail, and the savvy design FireDex designers have. Available in lots of sizes and widths--get the one that works for you. Check out some more details on our site to read up on more details about it's waterproof, moisture-proof barrier and more.